Non-pathologists, such as toxicologists and study personnel, can find it difficult to understand the data they receive from pathologists. Toxicological pathologists write long, detailed and highly technical reports. Study personnel are under daily pressure to decide whether lesions described in pathology reports are treatment-related and thus important to the pharmaceutical company or whether the lesions are background changes and thus of little significance. 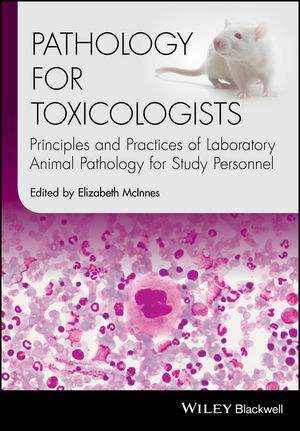 Written by experienced toxicological pathologists, Pathology for Toxicologists: Principles and Practices of Laboratory Animal Pathology for Study Personnel serves to bridge the gap in the understanding of pathology data, enabling non-pathologists to more easily comprehend pathology reports, better integrate pathology data into final study reports and ask pathologists relevant questions about the test compound. This succinct, fully referenced, full colour book is suitable for toxicologists at all stages of their training or career who want to know more about the pathology encountered in laboratory animals used in safety studies. Key features include important chapters on spontaneous and target organ lesions in rats, mice, non-human primates, mini pigs, rabbits and beagle dogs as well as information on general pathology, macroscopic target organ lesions, ancillary pathology techniques, haematology, biochemistry and adversity. Elizabeth McInnes edited the successful "Background Lesions in Laboratory Animals, A Color Atlas" (2011) and has published widely on various aspects of toxicological pathology. She qualified as a veterinary surgeon in South Africa in 1988 and completed a PhD at Imperial College, London in 1996. She was awarded Fellowships of the Royal College of Pathologists in 1997 and of the International Academy of Toxicologic Pathology in 2011. She currently runs her own toxicological pathology consultancy business.